The Treaty on the Non-Proliferation of Nuclear Weapons (NPT) "aims to prevent the spread of nuclear weapons to additional states while ensuring fair access to peaceful nuclear technology under international safeguards (audits and inspections). "There are two categories of parties to the treaty -- nuclear weapon states (NWS) and non-nuclear weapon states (NNWS). Under the treaty, NWS are defined as the five states that exploded a nuclear device before January 1, 1967 (United States, Soviet Union -- now Russia, United Kingdom, France, and China)." Iran is a non-nuclear weapon state. The following ia a brief evaluation of the November, 8, 2011, IAEA report, "Implementation of the NPT Safeguards Agreement and relevant provisions of Security Council resolutions in the Islamic Republic of Iran," with respect to specific provisions of the NPT. At the end of July 2006, the UN Security Council adopted Resolution 1696 making enrichment suspension mandatory under Chapter VII of the UN Charter -- which empowers the Security Council to act in the face of "threat to the peace, breaches of the peace, and acts of agression." 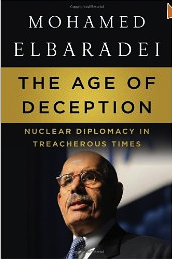 In "The Age of Deception" (p199), IAEA Director General ElBaradei writes that the resolution was of "dubious legality". There was still no proof that Iran's nuclear activity involved a weapons program. It was quite a stretch to say that a small laboratory-scale centrifuge-cascade constituted "a threat to international peace and security" when peaceful uranium enrichment is legal for all member states under the NPT. Article I: Each nuclear-weapon State Party to the Treaty undertakes not to transfer to any recipient whatsoever nuclear weapons or other nuclear explosive devices or control over such weapons or explosive devices directly, or indirectly . . . The IAEA report released on November 8, 2011, does not claim that Iran is in violation of Article I. Article II: Each non-nuclear-weapon State Party to the Treaty undertakes . . . not to manufacture or otherwise acquire nuclear weapons or other nuclear explosive devices; and not to seek or receive any assistance in the manufacture of nuclear weapons or other nuclear explosive devices. The IAEA report (paragraph 53) states: "The information indicates that Iran has carried out activities relevant to the development of a nuclear explosive device. The information also indicates that prior to the end of 2003, these activities took place under a structured programme, and that some activities may still be ongoing." The IAEA conclusion is based upon information it "has continued to receive, collect and evaluate" (paragraph 11) including information regarding "development of safe, fast-acting detonators, and equipment suitable for firing the detonators" (paragraph 38). Iran's efforts "were assisted by the work of a foreign expert" (paragraph 44). "But", according to Gareth Porter, "it turns out that the foreign expert, who is not named in the IAEA report but was identified in news reports as Vyacheslav Danilenko, is not a nuclear weapons scientist but one of the top specialists in the world in the production of nanodiamonds by explosives." "On 4 December 2007 US Intelligence concluded that the Iranians discontinued their nuclear program in 2003 and had not resumed it. The National Intelligence Estimate disclosed that all 16 US intelligence agencies reported that Iran was still enriching uranium and if they restarted the program with the desire to create an atomic bomb, they could produce one by 2010 or 2015." A year earlier, former Director General of the IAEA, Mohamed ElBaradei had warned that as many as 30 countries could soon have technology that would let them produce atomic weapons "in a very short time," joining the nine states known or suspected to have such arms. In 2010, the Belfer Center at Harvard University, estimated that 40 countries "have the technical ability to build nuclear arsenals". Having "the technical ability to build nuclear arsenals" is not a violation of the NPT. Indeed, this capability may be acquired in the pursuit of "peaceful nuclear technology" -- Article IV specifically permits this. Article III: Each non-nuclear-weapon State Party to the Treaty undertakes to accept safeguards . . . with a view to preventing diversion of nuclear energy from peaceful uses to nuclear weapons or other nuclear explosive devices. The IAEA report states (paragraphs 6 and 7): "Under its Safeguards Agreement, Iran has declared to the Agency 15 nuclear facilities and nine locations outside facilities where nuclear material is customarily used (LOFs). Notwithstanding that certain of the activities being undertaken by Iran at some of the facilities are contrary to the relevant resolutions of the Board of Governors and the Security Council, as indicated below, the Agency continues to implement safeguards at these facilities and LOFs. "Contrary to the relevant resolutions of the Board of Governors and the Security Council, that Iran has not suspended its enrichment related activities in the following declared facilities [Natanz, Fordow], all of which are nevertheless under Agency safeguards." However, the resolutions of the Board of Governors and the Security Council, demanding that Iran suspend its enrichment activities, is a denial of Iran's rights under Article IV of the NPT. At Natanz, the IAEA "has concluded that the facility has operated as declared by Iran in the Design Information Questionnaire". At Fordow, environmental samples taken at FFEP up to 27 April 2011 did not indicate the presence of enriched uranium". "The Agency is still awaiting a substantive response from Iran to Agency requests for further information in relation to announcements made by Iran concerning the construction of ten new uranium enrichment facilities". This information is required pursuant to the Additional Protocol that Iran accepted in 2003 as a voluntary, confidence-building measure, and agreed to suspend its enrichment and reprocessing activities during the course of the negotiations. The IAEA report does not claim that Iran is in violation of Article III. Article IV: Nothing in this Treaty shall be interpreted as affecting the inalienable right of all the Parties to the Treaty to develop research, production and use of nuclear energy for peaceful purposes without discrimination and in conformity with Articles I and II of this Treaty. Under the NPT, Iran is permitted to engage in "enrichment related activities" for "peaceful purposes". Naturally ocurring uranium contains 0.7 percent U-235. Iran requires enriched uranium for generation of electricity and for medical purposes (typically containing 20 percent U-235 -- weapons grade uranium typically contains 85 percent U-235). The IAEA report does not state that there's been a "diversion of nuclear energy from peaceful uses to nuclear weapons or other nuclear explosive devices." Iran has offered the international community several options to assure it that its enrichment activities remain in compliance with the NPT. Article V: Each Party to the Treaty undertakes to take appropriate measures to ensure that, . . . potential benefits from any peaceful applications of nuclear explosions will be made available to non-nuclear-weapon States Party to the Treaty on a non-discriminatory basis . . . Instead of making available to Iran "potential benefits from any peaceful applications of nuclear explosions" as required by the NPT, the UN Security Council, and Israel (which is not a signatory to the NPT) are denying and/or threatening Iran's rights under Article V -- i.e. the enrichment of uranium for peaceful purposes. Cyber attacks on Iran's nuclear facilities, and assassination of Iran's scientists, are being employed to thwart Iran's peaceful pursuit of nuclear technology. "The best way to know the full extent of Iran's nuclear doings is to offer it help" wrote Jack Boureston and Charles D. Ferguson in the Bulletin of the Atomic Scientists, November/December 2005. Instead of working toward "nuclear disarmament", Tony Benn, UK Cabinet minister in the Wilson and Callaghan governments from 1964-79, writes that the US is building a new class of nuclear weapons -- a violation of Article VI. "Despite government budget pressures and international rhetoric about disarmament, evidence points to a new and dangerous "era of nuclear weapons", the report for the British American Security Information Council (Basic) warns. It says the US will spend $700bn on the nuclear weapons industry over the next decade, while Russia will spend at least $70bn on delivery systems alone. Other countries including China, India, Israel, France and Pakistan are expected to devote formidable sums on tactical and strategic missile systems" according to Richard Norton-Taylor. Article X: Each Party shall in exercising its national sovereignty have the right to withdraw from the Treaty if it decides that extraordinary events, related to the subject matter of this Treaty, have jeopardized the supreme interests of its country. While Iran insists that it will not build nuclear weapons, should it choose to do so lawfully, it can withdraw from the NPT like North Korea did in 2003. India, Israel, Pakistan remain outside the NPT, and have substantial stockpiles of nuclear weapons. Is Iran being singled out because of its strategic location in the oil and gas-rich Middle East and Central Asia? According to John Pilger, "No blueprint for the new imperialism is more respected than Brzezinski's. Invested with biblical authority by the Bush gang, his 1997 book "The Grand Chessboard: American Primacy And Its Geostrategic Imperatives" describes American priorities as the economic subjugation of the Soviet Union and the control of central Asia and the Middle East." Threats of war against Iran are tantamount to terrorism. The dictionary definition of terrorism is "use of force or threats to demoralize, intimidate, and subjugate, esp. such use as a political weapon or policy". The UN High-level Panel on Threats, Challenges and Change defined terrorism as "any action intended to cause death or serious bodily harm to civilians or non-combatants with the purpose of intimidating a population or compelling a government or an international organisation to do, or abstain from, any act." Under any reasonable definition of terrorism, Israeli, UK, and US threats to attack Iran constitute terrorism. Such threats are also a violation of the UN Charter, Chapter VI, Article 33 -- "The parties to any dispute, the continuance of which is likely to endanger the maintenance of international peace and security, shall, first of all, seek a solution by negotiation, enquiry, mediation, conciliation, arbitration, judicial settlement, resort to regional agencies or arrangements, or other peaceful means of their own choice." In the April 2010 Nuclear Posture Review (NPR), the United States declared that it would not use nuclear weapons against non-nuclear-weapon states that are members in good standing of the nuclear Nonproliferation Treaty (NPT). Given repeated US and Israeli threats to bomb Iran's (NPT-compliant) nuclear facilities, and the war on Iraq for its non-existent weapons of mass destruction, Iran's reluctance to provide certain information to the IAEA (beyond that required by the Safeguards Agreement) is understandable. "The United States spends over $700 billion on defense each year; Iran spends a mere $10 billion." On what basis, asks Stephen M Walt, is Iran "the greatest threat to the world?" How many countries has Iran attacked in the last 50 years? 100 years? How many countries have Israel and the US attacked? Does this tell us anything? The technical issues with Iran's nuclear program could have been resolved within the IAEA, but they have become politicized within the UN Security Council, and driven Iran and the US further apart. To better understand the schism between the two countries, listen to this interview about Operation Ajax with the author of All The Shah's Men (ignore his statements about 9/11). It reshaped the history of Iran, the Middle East and the world.